I had two important events coming up in the lives of two friends of mine. One was getting married, and the other was having a birthday. More on the birthday girl later. I was doing the food for the shower/bachelorette party we threw for my friend the bride. I already was planning on making cupcakes, but I wanted another snack/handy dessert. 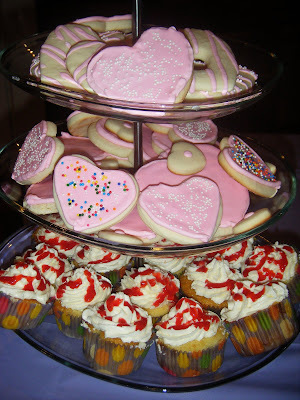 I decided to finally use the sugar cookie cutters I had bought, planning to use for Valentine’s Day, but never did. I tried one recipe, and I won’t even bother posting it, but I was NOT happy with the results. So I pulled out my Martha Stewart Cookies cookbook, and low & behold she has not one but four recipes for sugar cookies, two of which are for cutouts. I went with her basic “Sugar Cookie Cutouts” which oddly, I can’t find that exact recipe on her site. So I can’t link to it. The directions say to divide the dough into two halves, and wrap in plastic wrap and refrigerate until firm. I saved one half to do cookies for the birthday girl the following week, and set out to do hearts with Royal icing for the bride. These were super simple to roll out and cut into the desired shapes, and tasted great. If you’re looking for a no-fail recipe, try this one. I also used her recipe for Royal Icing, and there’s nothing wrong with it, I just don’t have the patience or the hand skills for it! 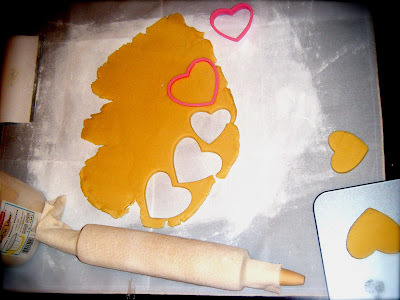 So, needless to say, you most likely won’t be seeing cookies iced this way again on my blog again! I know lots of people that do amazing, creative things with it, I’m just not one of them. Preheat oven to 325 degrees with racks in upper and lower thirds. Let one disk of dough stand at room temperature just until soft enough to roll, about 10 minutes. Roll out dough on a lightly floured work surface to just under 1/4 inch thick, adding more flour as needed to keep dough from sticking. Cut out cookies with a 4-to-5-inch cookie cutter, transferring shapes to parchment paper-lined baking sheets as you work. Roll out scraps, and repeat. Repeat with remaining disk of dough. Chill cookies in freezer until very firm, about 15 minutes. Bake, switching positions of sheets and rotating halfway through, until edges turn golden, 15 to 18 minutes. Let cool on sheets on wire racks. Decorate as desired. And now… for the birthday girl! She’s a dog-lover to the extreme. In her tiny apartment, she has multiple, large breed dogs! She is even a “puppy raiser” and raises dogs from the age of puppies, that go on to become leader dogs. Pretty cool huh? Once, while browsing Michaels, and I saw a really cute dog-bone cookie cutter, like this one, and I KNEW I had to buy it for her! This was in like January or something. So, back to the cookies. When I knew I’d be making cookies for the bride, and would have extra cookie dough, I couldn’t resist using the “gift” just once before giving it to the birthday girl. 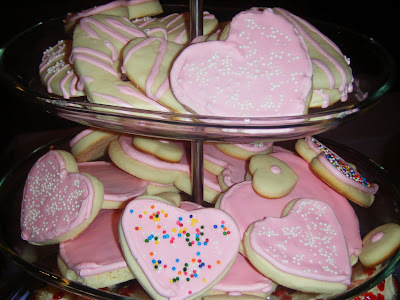 So I cut out these adorable cookies and decorated them with nonpariels (I have a slight obsession with them, ok?). I left them as a surprise at work for the birthday girl, along with the chocolate ones (recipe coming tomorrow! ), and I wasn’t there when she got them, but I think they were well received! They were well recieved by many! Awwww!! My birthday cookies!! 🙂 Yes, I hold a special place in my heart for these cookies! They were definitely well received! I even gave my girls a little piece to try, but I just HAD to keep the rest for myself. 🙂 Thanks again! I love how you spelled out the words on the doggie bones, so cute! They’re so cute – I love all the sprinkles! What pretty cookies! I’m with you though, I prefer easy everyday cookies, over the fancy kind that require lots of artistic ability!